More than anything, Vinny Testaverde desperately wanted to prove his mettle. Though he knows that he won’t be counted on to throw for 300 yards despite of having been on the roster of good defensive team, but still he managed to give the team its best chance to win some games and not let the season get away. More than that, he did against the Buccaneers. 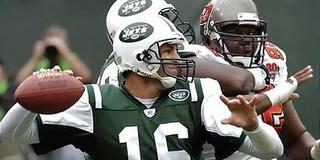 The 41-year-old quarterback led the Jets to a 14-12 win over the Tampa Bay Buccaneers. He looked at ease in the pocket and provided a steady play for his team to be factors in the chase for division title again. The Jets' special teams and defense are solid, and Testaverde will only get better each week as long as the Jets can get their running game going. He just needs to use his strength, knowledge of the game and ability to play smart. Let’s anticipate how this young quarterback will take care of the football. If the Jets hope to challenge for a playoff spot, the defense must set the tone. The team offense seems to be in mess. A year that started with so much promise was on the brink of disaster. But when Testaverde took the command, he sent chills down the spine of the spectators. Testaverde will play in weeks to come as the replacement for injured Chad Pennington and Jay Fiedler.